15% de prepago con 30 dias de antelacion. Anulación entre 14 dias o menos no hay devolución de dinero. se aplica el cargo por NO SHOW. There are 5 new buildings, opened in December 2010, in an area of 1300 m2. The facilities, furniture and decoration were chosen to give you the best comfort. With native wood in Mañio, Canelo, Oregón and Insigne pine, a sober decoration that allows you to rest in a semi-rural location of Dalcahue City. 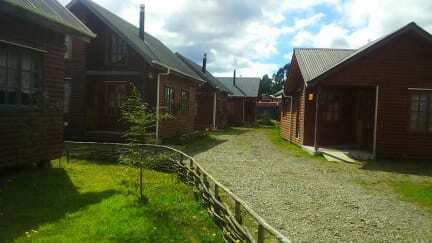 Our Cabins are located in Los Queltehues 575, high Dalcahue sector. We are very close to the center, 3 minutes by car and 15 minutes walking. A 10 minute drive from the airport of Chiloé. There is also a taxi agreement to facilitate your sightseeing or other needs. 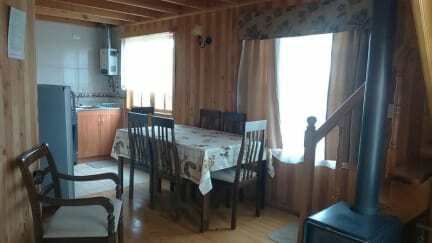 Buildings of 2 floors with 3 bedrooms, American beds, full kitchen, living room, digital TV, Internet WIFI, slow combustion, private parking, and personalized attention from the owners. We provide a personalized service of tourist information so they can tour the island and enjoy your stay. Are also available: bus schedules, routes, maps and information of interest. Check out from 10:00 to 12:00 . The establishment is not taking responsibility for lost objects or money, in or out of the cabins. Do not consume food or alcohol in rooms, for these effects is available dining room and kitchen. Pets are not allowed into the cabins, except properly accredited guide dogs. Not smoke inside the cabins. We provide: microwave, fridge, hair dryer, iron, barbecue, Wi-Fi and computer with internet in reception office (only for responsible adults). Please, throw out the papers and the garbage into the trash can, located in and outside of the cabins. The water heater is automatic. Please be quiet and respect the silence between 23:00h and 08:00h.